Edward Wormley (1907-1995) is best known for his association with the Dunbar Furniture Co. of Berne Indiana. Hired by Dunbar in 1931 to improve its' inexpensive tradional lines, Wormley's simple outlines and quality surfaces and finishes propelled Dunbar's modern lines to the top of the American market within 5 years. Never leading edge or overly adventurous, influenced and inspired by both classicism and modernism, Wormley's furniture presented traditional motifs in modern forms using the finest materials and highest production standards. The company never truly modernized, instead retaining hand-made production lines that created furniture of the highest quality but led inevitably to financial failure. Absent from Dunbar during WW2, Wormley set himself up as a consultant in the post-war period and produced the Precedent line for Drexel, then returned as Dunbar's design director where he designed over 100 pieces annually in areas ranging from furniture to lighting and textiles. 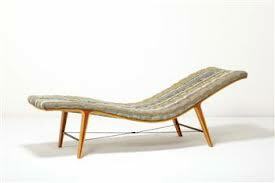 His best-known Dunbar designs include the Listen-To-Me Chaise. the Tete-a-Tete Sofa, and various small tables inlaid with Tiffany and Natzler tiles. He was widely admired both within the design industry and by the greater public, and participated in Good Design Exhibitions presented by MOMA from 1950-55. Two years after his death in 1995, the Lin-Weinberg Gallery in New York City presented a retrospective of his work entitled Edward Wormley:The Other Face of Modernism, an event that helped launch a new wave of appreciation and scholarship of 20th Century Design.